Synopsis: A study of the advertising industry based on four years of interviews in New York, Tokyo and London. It produces some disquieting revelations, and raises a number of worrying and important questions. The author is an investigative journalist, who has previously written four thrillers. From Publishers Weekly&colon; This study of modern advertising worldwide is as contentious as it is thorough. British journalist Clark describes in exhaustive detail an industry that targets as captive customers children, who spend more time watching TV than in school, and can zero in on consumer "grazers" 18-30 years old, who eat lightly and often and buy more of everything than anyone else. He shows us tobacco and liquor advertisers who subtly evade regulation, giant pharmaceutical companies with identical therapies that push their own brand names on doctors through gifts, entertainment and a barrage of trade ads, and political TV spots that overwhelm democracy in national elections. Many ads don't merely bend the truth, charges the author--"they are outright lies." 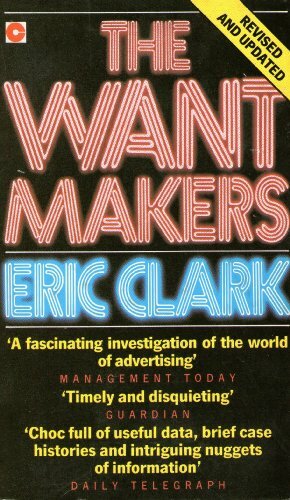 Clark attempts to present a balanced picture of the industry, yet he suggests that things may have gone a bit too far when the referee in a sponsored TV sports event calls fouls repeatedly so commercials "can be fit in." 20,000 first printing.